When about half of new hires fail in the first 18 months, clearly there is something wrong with the system. According to a recent study, 89 percent of the time, the reason these hires fail is because of the hire’s attitude, rather than lack of skills. Not only is this extremely inefficient, but also it’s very costly to hire the wrong person. The total cost of interviewing, selecting, and onboarding a new employee can be tens of thousands of dollars. Couple this with the fact that replacing an employee can cost 20 percent of his salary, it’s now more important than ever to recruit intelligently and make the right hire. In the typical screening process, you read through hundreds of resumes and conduct tons of phone interviews to narrow down candidates. It’s extremely time consuming and doesn’t always pay off. Employers need to make hiring decisions based on more than skills, but traditional tools like resumes don’t cover much else. It’s hard to tell if a person will be a strong cultural fit based on their resume and initial phone screen. How can employers determine true fit? Social media sites such as LinkedIn have made strides to give employers a more complete profile of applicants, but those services focus on aggregating content, and not at all on selling credentials, says seasoned recruiting consultant Jeffrey Freeland. That’s why, in March 2013, Freeland founded Jobularity, a new approach to social networking that allows you to find true compatibility in the hiring process. Jobularity matches candidates with job positions on a “multiple dimensions of compatibility” basis. The service aims to give employers a deep understanding of how a candidate would fit a company’s mission, culture, and ideals, before the candidate signs on. The primary feature of Jobularity is an alternative to the conventional resume called the Zumay, which showcases a candidate’s unique personality through video monologues, video endorsements, and descriptions of professional goals. It looks at the candidate’s experiences, personality, impact at prior workplaces, and capabilities. The Zumay also determines a candidate’s personal aspirations, passions, ideals, behaviors, work style, ambition, loyalty, tenacity, and work ethic. Employers can use these details to hire candidates who are a fit in all aspects of importance. A user-created profile showcasing the whole individual: goals, character, motivations, achievements, skills, and work history. Video components to convey the majority of communication that is non-verbal. This feature gives a fuller view of the candidate from recorded monologues, as well as a better explanation of your company with personalized messages describing your mission, the open position, the culture, and the ideal candidate. An intuitive dashboard that lets job seekers monitor interested employers, track applications, and respond to requests for appointments. It simplifies the entire process. 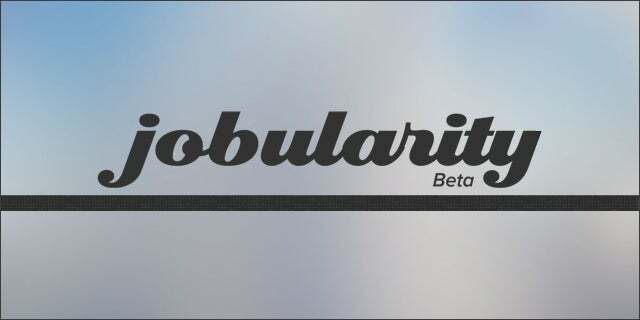 Jobularity is currently working with several companies in the beta version, and hopes to go public with our customers very soon. While they continue to build up a user-base, the service is completely free. Ditch the outdated resume and sign up today. To learn more about Jobularity, visit their website.